It’s just so hard to leave the vacation life behind. This trip has been especially hard to get over, and has left me dreaming of grand canals and cappuccinos. And the fruit. Besides the fact that everything tastes better on vacation, I can say without any doubt that I devoured the freshest and most delicious fruit ever in Italy, namely pineapples. I actually opted for a cup of mixed fruit rather than strolling through historic streets with a scoop of gelato, not that I didn’t have a fair share of gelato. And i’m not really a fresh fruit person. I like my fruits in a pie or topped with cream, so i’m going to share this childhood favorite recipe with you. I call it pineapple delight now because my kitchen genius of a cousin told me that’s what it’s called, but it was always known as ‘that cheesy pineapple dessert’ to me. I finally got the recipe from her last summer, and i’m pretty surprised I haven’t posted it yet. It’s perfect for summer, among other perfections. It’s rich with flavor, yet light in texture. It’s baked in a scorching oven, then chilled overnight. The makes for the perfect dessert. Here’s what it looks like fresh out of the oven. Top it with some whipped cream and you’re good to go! It’s pretty simple to make. It’s a matter of throwing all the ingredients into a food processor or blender. Here’s what you’ll need. In a large food processor or a blender add the condensed milk, evaporated milk, and half the pineapple. Blend until everything is pureed. Pour into a large bowl. Then blend the remaining pineapple, whipping cream and sour cream. If you have a huge food processor you could probably fit all the ingredients in at once, but I always mix everything in two batches so nothing overflows. But you need to whip all the ingredients or they won’t set in the oven and you’ll be left with a hot liquid that is too rich and sweet to eat. (You can also just blend everything except the pineapple at once, then in the second batch just blend the pineapple, and mix the two mixtures. Pour it into a greased oven proof dish (I usually bake this in a medium pyrex dish) and bake for about 40-50 minutes, or until you see the top turning into a golden brown film and the sides bubbling. Then turn off the oven and let the dish cool in the oven. After about an hour cover the dish in cling film and refrigerate overnight. If not overnight, then at least for five hours. I usually cover it with some cool whip or whipped cream, just to decorate it up a bit. This dessert is divine. This should be good for up to 10 people, but it’s usually finished with just 3 or 4 around. Yes, it seems to be chocolate week here, but in my defense, I didn’t make the Nutella pie or this pie, i’m just hoping one of you will. It’s one of those cream based pies I was talking about in my last post, and it doesn’t require any baking or cooking, just a fridge. 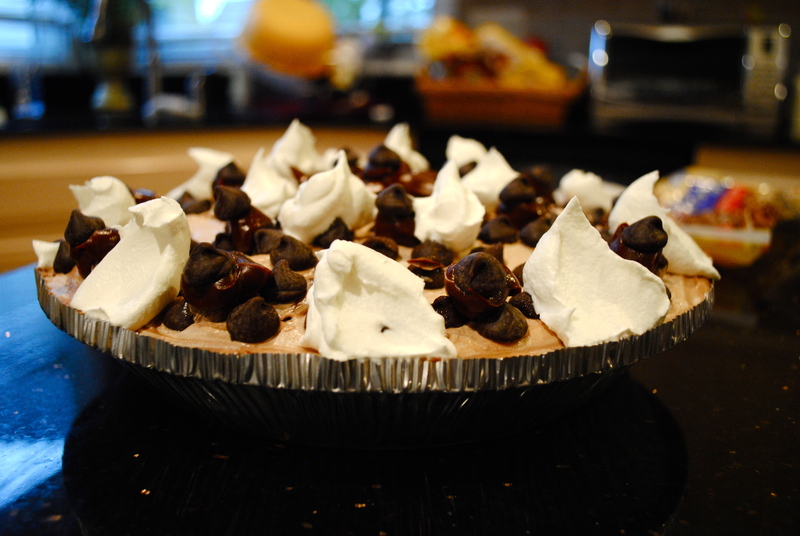 Since the base flavor of this pie is chocolate, make sure you use good quality chocolate, not just any baking chocolate. You can even use hershey’s or galaxy chocolate bars, but I insist that you use nestle semi sweet chocolate chips if they’re available wherever you live! I know for a fact that they’re available in Lahore and obviously USA, but I haven’t found them yet here in Germany. Dr. Oetker chocolate is great though. I have step by step pictures for this one! And before you start getting the ingredients together, here are a few tips that will make your pie turn out the same every time you make it. Make sure that the chocolate you use is at room temperature. The cream has to be chilled through. Use an electric hand mixer. I didn’t when I made this, and it added 10 minutes to the prep time. Always use semi sweet or dark chocolate. Don’t over whip the cream. Stop when stiff peaks start to form. 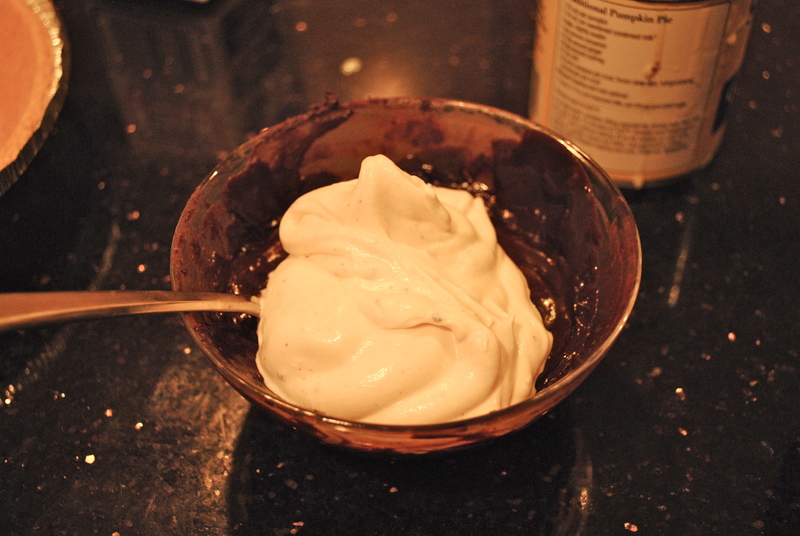 If you over whip the cream it won’t mix well with the chocolate and end up looking like scrambled chocolate eggs. Start off by mixing the cookie crumbs and 2 tablespoons of softened butter. In a 9×9 or 8×8 inch pie plate press in the buttered crumbs evenly and up the sides. I used a ready made one and drizzled some chocolate fudge I had left over just to add some more chocolate. You can add caramel as well, but it’s not necessary, because the filling is rich enough. Then in a bowl whip the cream and condensed milk. 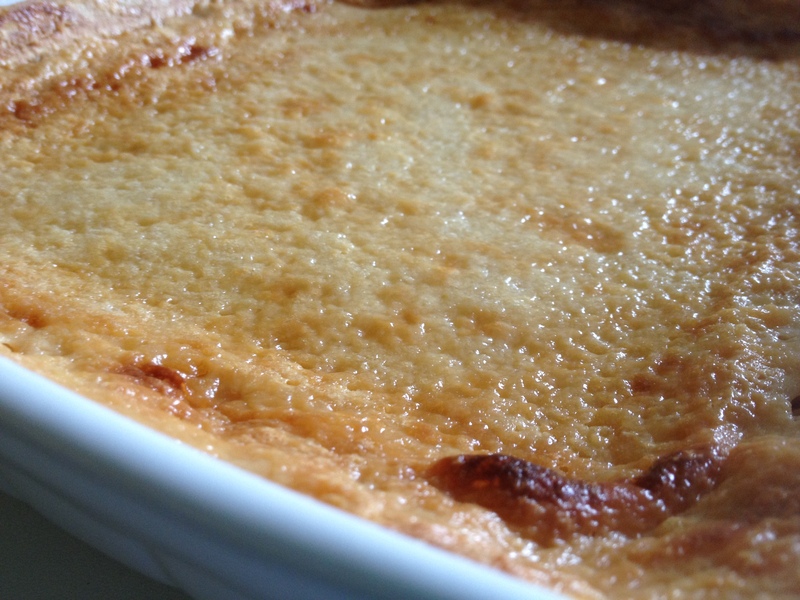 Add the condensed milk gradually and start off at medium speed. Then once the cream starts to thicken increase the speed of the electric mixer. 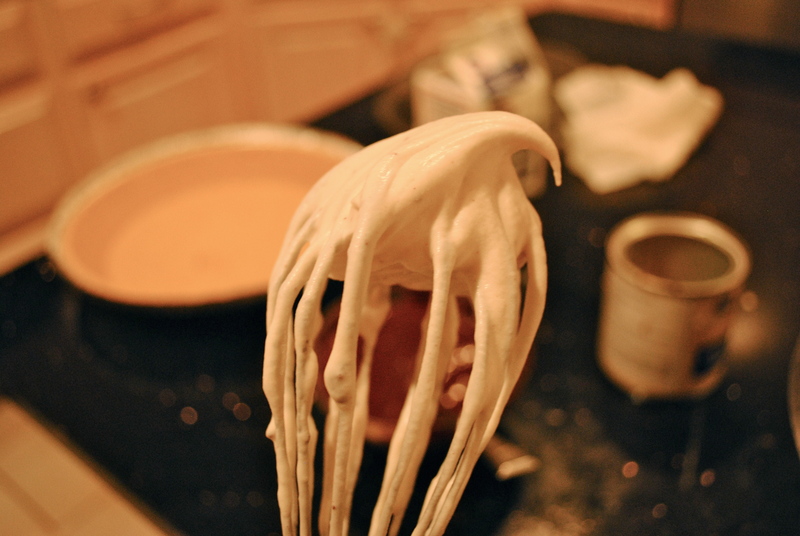 Whip the cream and condensed milk till stiff peaks form. 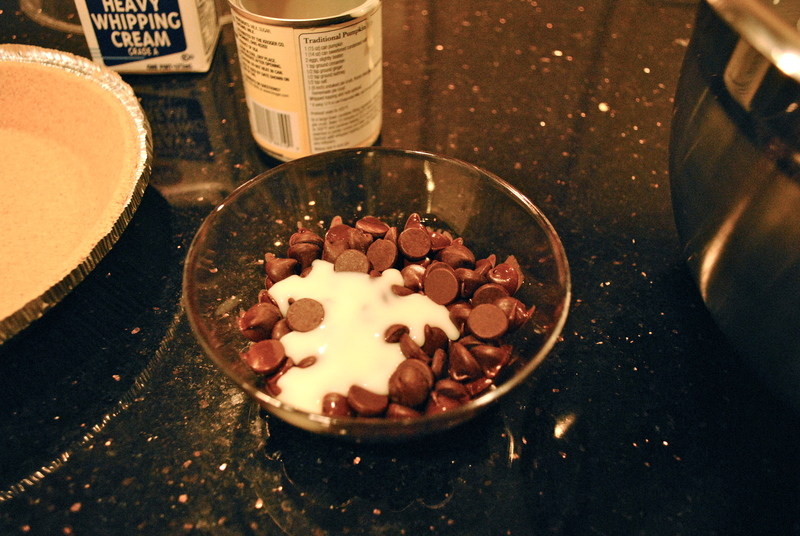 Set the cream aside and place the chocolate chips and 1 tablespoon of butter in a microwave proof bowl. Microwave for about one minute, stir, then again for 30 seconds. 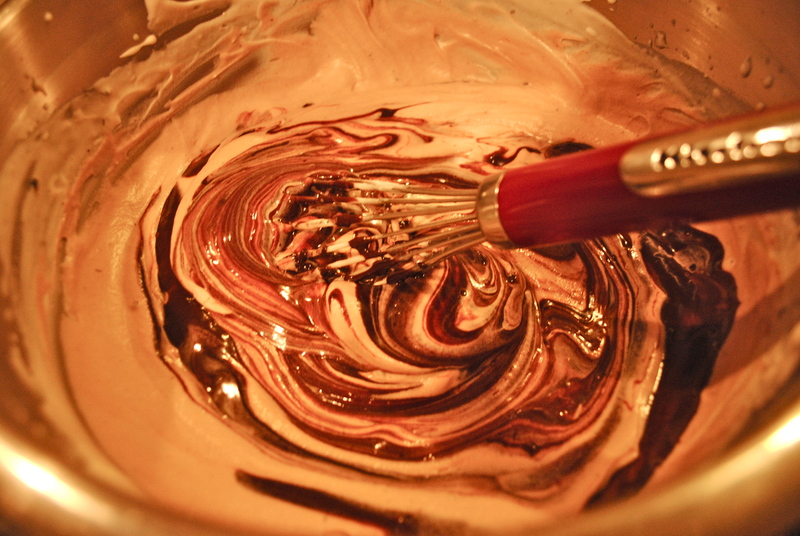 If the chocolate has melted after the first minute don’t heat it again. The chocolate has to be smooth and creamy, no lumps! If you think it’s easier you can melt the butter and chocolate in a saucepan. 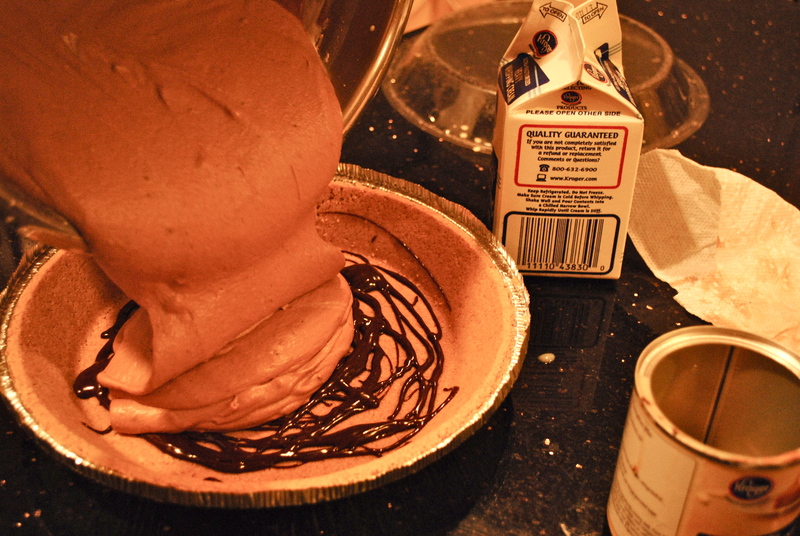 Once the chocolate has melted add in 1/4 cup of the whipped cream and mix well so the melted chocolate loosens up a bit. 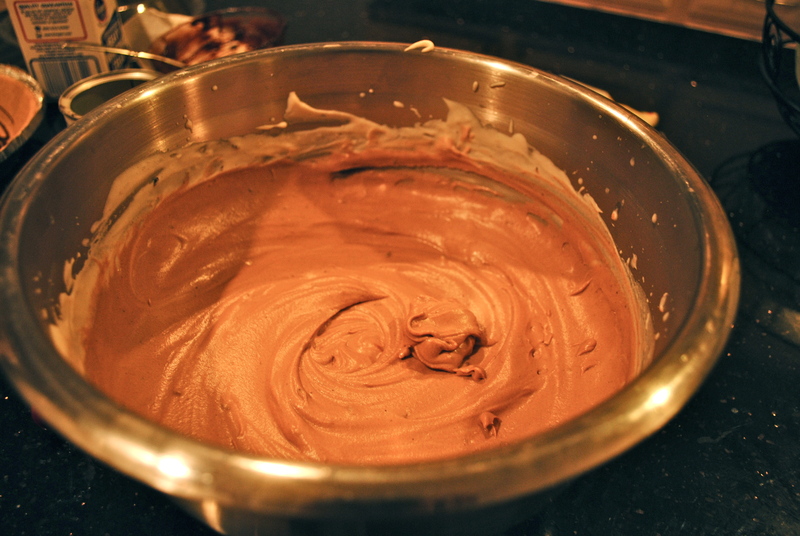 Then add in all the chocolate to the cream mixture and fold together till well mixed. 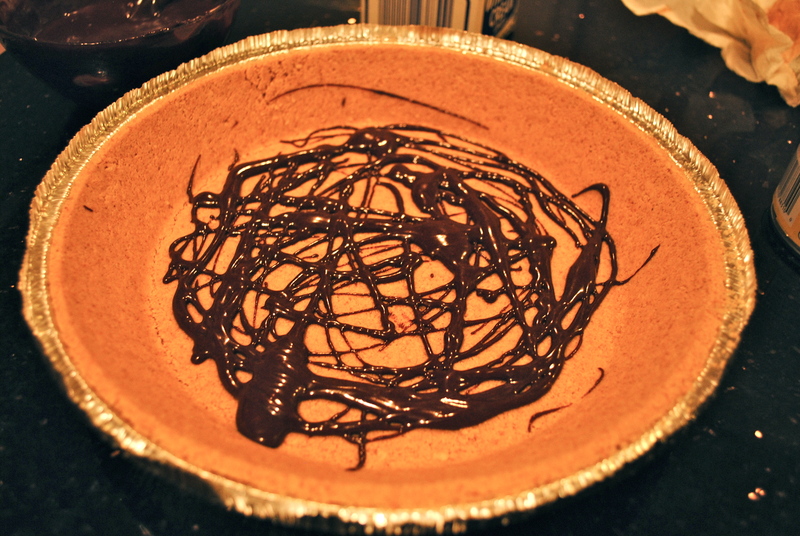 Now all you have to do is pour the fluffy and smooth chocolate filling into the pie crust. You can decorate it with more chocolate, whipped cream, or just leave it. But i suggest using some whipped cream to make it look pretty. Enjoy! Just remember, chill the pie in the fridge for at least 2 hours, but the more it’s chilled through, the better it cuts into slices.